Wrought iron is actually a material, not a descriptive term for items made in iron. Wrought iron is the forgeable, ferrous material made until about the mid-twentieth century that has been replaced by modern mild steel. It was originally called “wrought” (“worked”) to distinguish it from cast, or poured iron, because its manufacture required extensive forming under power hammers and through rollers. It is characterised by its composite nature which is fibrous like wood, although you cannot tell by just looking at it unless, it has been broken or badly corroded. The fibrous material is iron silicate, intimately mingled with the iron, and it gives wrought iron a combination of resistance to corrosion, plasticity when hot and, tensile strength when cold that are generally greater than in mild steel. The Real Wrought Iron Company, is the only supplier of genuine wrought iron in the world. We supply both puddled and charcoal wrought iron to blacksmiths throughout the world, for use in the restoration of historic ironwork and the construction of prestigious architectural ironwork commissions. Ironwork should not just be black! One of National Heritage Ironwork Group’s (NHIG) goals is to educate those outside of the fields of conservation, who may have stewardship of historic ironwork, about the importance of proper treatment of decorative ironwork, including the most important recurring conservation process, that of refinishing. An illustration of the harm that can be inflicted on works of art is the recent act of well-meaning ignorance by the overseers of the Globe Theatre, who had the sumptuously and subtly multi-coloured Globe Theatre Bankside gates painted in thick gloss black, obscuring both the details and the original stainless steel, copper, gemstone and graphite finishes of the many features contributed by artists from all over the world. Click here for an explanation of the history of colour fashions for decorative ironwork finishes. Black has only been the norm since the 30’s and the new black is… whatever you like. Puddled iron is a mixture of nearly pure iron with up to 5% siliceous (glassy) slags, which take the form of linear fibres – giving the metal its characteristic grain. Puddled iron is for the more advanced forger, more so than steel or homogeneous pure irons. Care must be taken to respect the properties of the material. It is necessary, when forging puddled iron always to do heavy forging at a high temperature – around 1350 to 1450 degrees Centigrade (bright to sparkling white heat). At these temperatures, the iron will move very quickly, whilst doing no damage to the grain structure. Finishing work, bending etc., can be done at red heat. 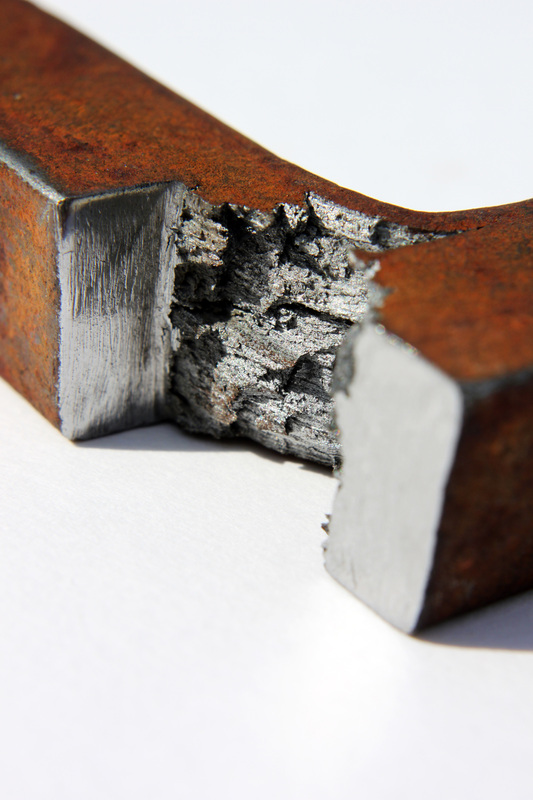 Should heavy working at lower temperatures result in splitting along the grain boundaries, it is necessary only to heat the iron to a welding temperature to close the split under the hammer. At a white heat it will be found that wrought irons are far softer to forge than even pure iron. This is due to the internal slags melting and providing an internal lubricant that reduces friction during distortion under the hammer. There is nothing to beat the forge-welding ability of puddled iron, as the enclosed slags form a natural flux, allowing the iron to be heated rather more than can pure irons or steel, this extends considerably the heat range over which the iron can be welded. Wrought iron is the traditional material of the blacksmith. Due to the siliceous slags combined with its fibrous structure, it resists corrosion far better than modern steels or pure irons, as is amply shown by the survival of much of our heritage of wrought ironwork, in many cases centuries old. It is neither necessary nor recommended to galvanise or zinc spray wrought iron. NHIG have announced they will be holding a one day seminar on Friday 11th November 2016 at The National Maritime Museum, Greenwich. West Dean College in West Sussex is running a short course covering the conservation of structural metalwork and architectural features and includes repair techniques of both ferrous and non-ferrous metals. Further details can be found by following the link below.